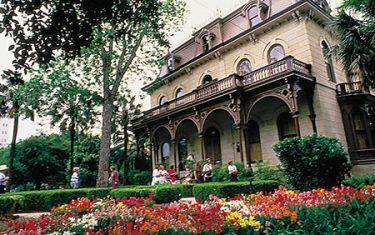 The Steves Homestead House Museum is an elegant three-story Victorian mansion located in the King William Historic District. The Homestead reflects the sophistication of this historic neighborhood, which was settled in the 1800s by prominent German families, and offers visitors the rare opportunity to imagine living the lifestyle of wealthy families of this era. On display at The Homestead are furnishings, fixtures and decor that brings the family’s stories to life. The property also features original outbuildings, including the first indoor swimming pool built in San Antonio. Self-guided tours are available daily and guided tours are available Monday through Friday. An adult combo ticket with nearby Villa Finale, guided group tours, and a weekly “behind-the-scenes” tour of the Homestead are some of the special options available. Free on-site and/or street parking is available; the first floor is wheelchair accessible. The Homestead is open daily from 10 a.m. to 3:30 p.m., except for major holidays.